Instructors working with TAs or other assistants are encouraged to create “Master Classes” and add their assistants to different “sections” of a class. This allows the instructor to have full access to all papers while allowing TAs to grade papers as needed. Turnitin/ANGEL Users: Using Master Courses can break the link between Turnitin and ANGEL. TAs just need Editor rights in ANGEL to access Turnitin as an instructor. Note: A Master Class is allowed to contain just one section. Sections can be aligned to sections in the Penn State registration system or some other method such as an alphabetically ordered subset of students in a large-enrollment course. Unless a TA is an instructor of record of a section, the instructor of record must request accounts for their TAs. Please use the TA Request Form to send names and Access Account User IDs. Please allow one business day for requests to be processed. Also note that these accounts may be deactivated after the end of the semester. Do not add TAs to a Master Class until the IT Service Desk sends notice of when the accounts will be active. On the day that activation occurs, you can use the procedure below. Log in to http://turnitin.psu.edu. You should be directed to an instructor dashboard with an Add Class link. Note: If you do not see this, then make sure that 1) your level is set to Instructor and not “Student” and 2) you received a Quickstart guide and followed the activation instructions. Click the Add Class button to begin. Select Master class from the “Class type” menu. Enter a descriptive Master class name (e.g. “LING 100 SP 2012”). You can enter a TA join password if you want to allow TAs to enroll themselves into a section of your course. See the “Enrolling TAs” section below for more information. If you have created a standard class, it can be converted to a master class if the process is done relatively early in the semester. Log in to http://turnitin.psu.edu to view your list of classes. Click the Edit (gear icon) next to the link of the class you wish to convert. On the next screen click the button for Convert to Master Class. At this time, there can only be one TA per section. For large sections with multiple TAs, you can split the roster into sections according to student last names or teams and add just one TA. Log in to http://turnitin.psu.edu to view your list of classes. Your master class will be listed with a “+ Section” link. Click the “+ Section” link to create a new section. Note: The same person can be assigned to more than one section. In the “Step 2” window, enter a Section name and Section enrollment password for students to use. Note: This password can be changed by the TA later by clicking on the Edit (gear icon) for the section. Click Submit to complete the process. A window with section class ID and password will open. You can send the six-digit class ID and password to your TA who can pass the information on to students in that section. Once you have created a section, your TA will receive an e-mail message from Turnitin with instructions on how to log in. TAs new to the Penn State Turnitin service will need to create a Penn State Turnitin account. This can be done as follows. Make sure you have received a Turnitin class ID and password from your instructor. Wait for a welcome message from Turnitin.com before attempting to log on. If you follow the activation instructions, do NOT use your Access Account password. Note: Accounts with any other e-mail could risk being temporarily disabled. This is for security purposes. Log in to http://turnitin.psu.edu with your Access Account to confirm your instructor level access. Follow the steps to join your section as the instructor. If you see a Server Error message from turnitin.com or can no longer log in as an instructor please contact the IT Support Desk for immediate assistance. You may be asked for information about your course and instructor of record. Log in to http://turnitin.psu.edu with your Penn State Access Account and ID. If you see an account set up screen, confirm or enter your official Penn State e-mail address (e.g. xyz123@psu.edu) in the username field. Set your user level to teaching assistant, then click Submit. Note: You do NOT need to enter a password. 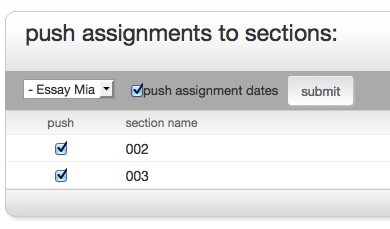 Within his or her section, a TA has the ability to add assignments and view papers. TAs can also send out a section ID and password to students to enable them to upload assignments into Turnitin. In a master class, the main instructor can create assignments and “push” them to some or all sections. Click the link for the master course to enter it. Click Add Assignment and create as any normal assignment. After the assignment is created, an option is presented to push assignments to section. Check the sections where the assignment should be then click the Submit button. Clicking the link to enter the master class and view assignments. Clicking the link not pushed next to the appropriate assignment to open the push assignment window.